TD-11E has strengthened this afternoon and the NHC has declared it to be Tropical Storm Kiko. Labor Day weekend brings the end of meteorological summer, which has been extremely dry here in northwest Tucson, but very wet in most of southeast Arizona. 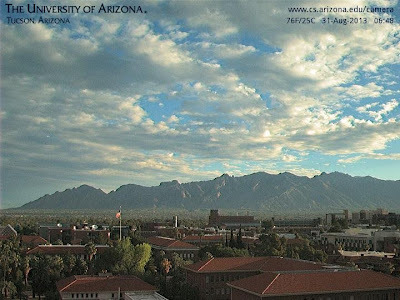 The weekend started with middle clouds (above) drifting over the Catalinas this morning (Saturday, August 31st) and clear skies east, with clouds west. Precipitable water is trending slowly down after two days with values holding around 2 inches. Even though it was wet, there was marginal CAPE, so thunderstorm activity has been relatively suppressed. There was considerable old anvil cloud over the Tucson area yesterday, and only some lightning strikes on the north slopes of the Catalinas (below is CGs through 6 am MST this morning). A light anvil rain here late in the afternoon produced 0.01" in the gauge. 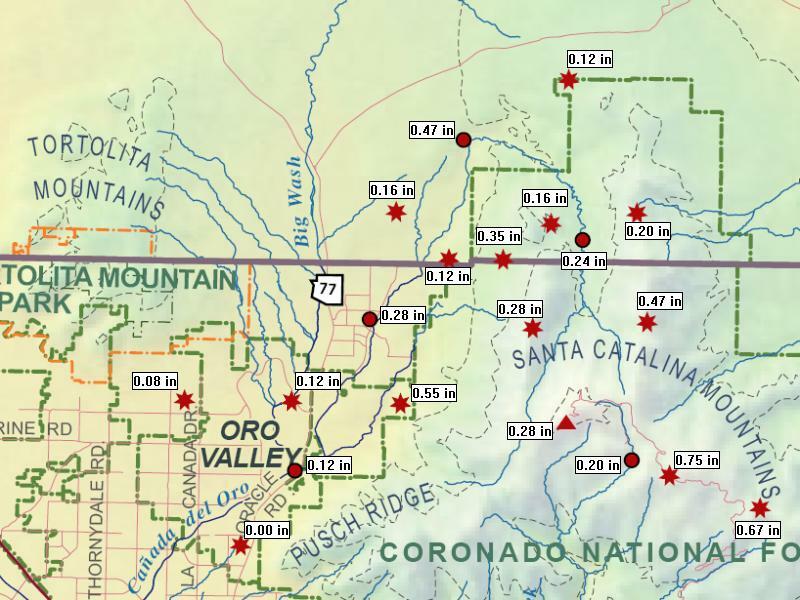 Across the ALERT network only 23 sites had mostly very light rainfall - these were almost all at higher elevations in the Catalinas, Redington Pass, and the Rincons - in the Catalinas White Tail had 0.55" and Marshall Gulch had 0.43". All the models forecast little of interest today and the early runs of the WRF forecast isolated showers over the Catalinas. There is still CAPE present and there may be more activity over higher elevations than models forecast. At 7:15 am (below) the clear/cloudy boundary is hanging right overhead, so there'll be abundant sunshine over much of southeast Arizona, with more heating than there has been in several days. 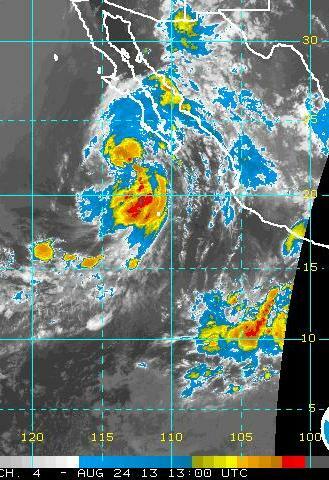 Finally, another tropical depression has formed west-southwest of the south end of Baja - TD 11-E. The NHC forecasts it to move little and to be quite weak (below). If it were to become a storm, it would be named TS Kiko. It was an interesting day yesterday with many of the convective towers, especially in the afternoon, having a very tropical-like appearance, i.e., somewhat small and some not deep enough to produce anvils. Rainfall during the day was quite limited (at 5 pm MST only 28 of the ALERT sites had measured rain). However, during the night showers occurred over many parts of the network. This morning at 5 am the number of sites with rainfall during past 24-hours had increased to 68 (74% areal coverage). Amounts were better than yesterday with 36 sites having 1/4" or more rain and 14 sites exceeding 1/2". 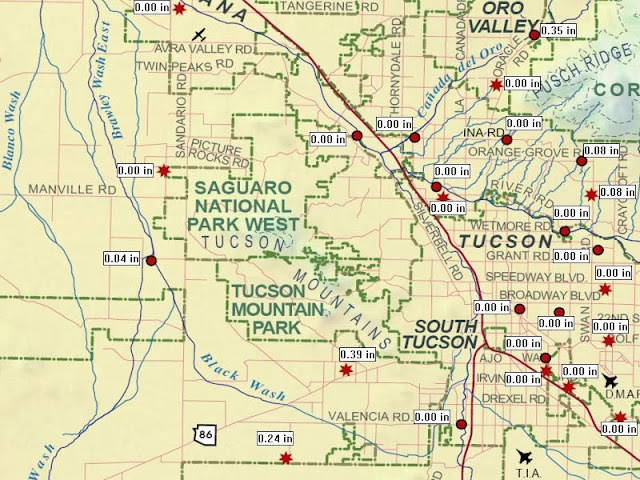 I've cropped two sectors of the ALERT network - above and below - to focus on the Tucson metro area. These two illustrate well that the showers avoided the lowest elevations and most of the city - we had a couple of sprinkles here, so another Trace day. 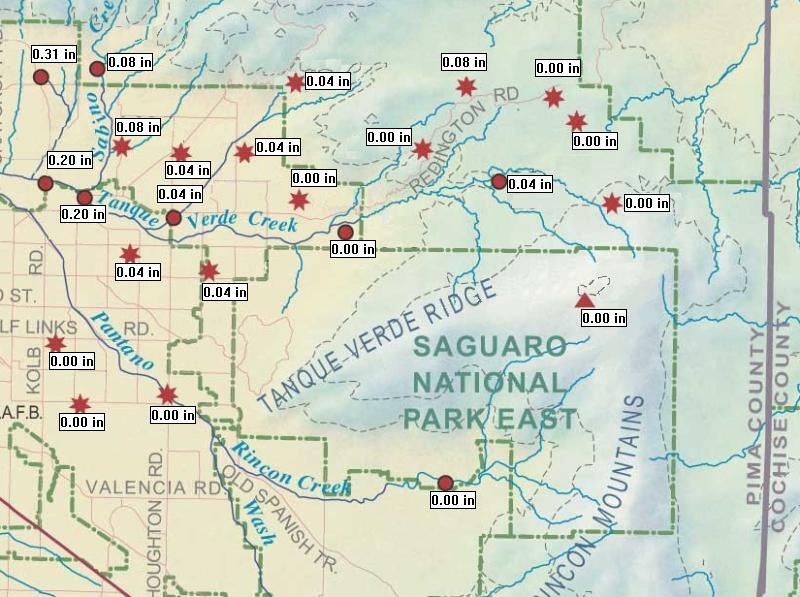 The lack of CG lightning strikes over Pima County during past 24-hours ending at 6 am MST this morning (above) indicates the dominance of warm rain processes locally. Visible satellite image below from 7:15 am today shows that widespread cloudiness continues. 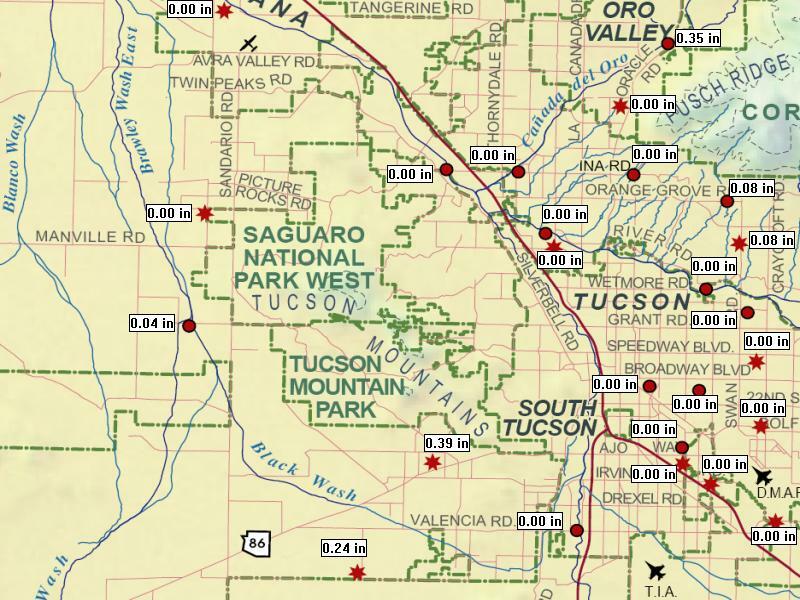 PW remains very high across all of southern Arizona. The 12 UTC 500 mb analysis from NCAR RAL (above) shows that a weak piece of the IT has embedded itself in the anticyclone and now lies west-to-east across central Arizona. All of the models this morning shift the most significant storms and rainfall into the northern half of the state today, with much diminished shower activity across the south half. The morning sounding for Tucson (below) continues to indicate some CAPE, especially for the high elevations, and heavy rain potential if strong storms develop. There is essentially no steering flow and stronger winds are limited to the upper levels of the troposphere. I'm sure folks with swamp coolers are eagerly awaiting a dry out! This morning's Tucson sounding (above) is soaking wet, with almost 2 inches of precipitable water (PW). The sounding has some CAPE, given even small amounts of solar heating. Wind profile is not great with part of the inverted trough nearly overhead. Notice that the K-index is 42 - also very high. Both versions of the early runs of the WRF model appear to forecast too much solar radiation, given the heavy cloud cover this morning. GFS forecast solar radiation above is w/m**2 at 11 am MST and below is NAM forecast valid at noon. Both versions forecast widespread rain across southern Arizona but with mostly light amounts. I didn't dig deeply into the forecasts, so I'm not sure why the convection is fairly mundane in the WRF forecasts. However, this morning's run of the NWS NAM goes the other direction and forecasts a very big precipitation event for today - above is NAM forecast of rainfall through 8 pm MST this evening. Likely outcome probably will be somewhere in between these model forecasts. 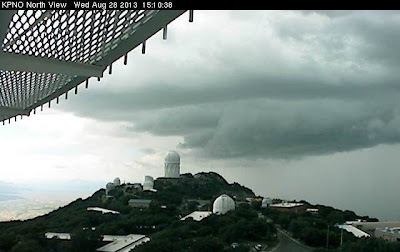 Above - heavy storm approaching Kitt Peak from the northeast at 3:10 pm MST yesterday afternoon. Models were correct in forecasting most storm activity to stay west and south of Tucson and the early WRF-GFS had too much activity forecast over eastern Pima County. Strong, downslope east winds proved to be a real negative factor yesterday. East winds 20 to 30 mph continued until after 4 pm, when an outflow moved across the metro area from the south to southwest. The outflow didn't force much new convection and all but the far west and south parts of the ALERT network remained dry. Only 14 sites had light rainfall during the afternoon through 5 pm and only 3 more picked up rain after 5 pm - 24-hour coverage at 5 am MST this morning was 18%. Nothing here at house. Plot of CGs through 24-hours ending 5 am this morning (below) shows heavy activity from central Pima County westward and no lightning over all of southeast Arizona. Sunrise this morning showed heavy cloud cover over Catalinas - above. And regional visible image at 7 am below shows widespread cloud cover from the Four Corners extending to the southeast, south, and southwest into Mexico. Will be limited sunshine today and there are showers around this morning - TUS just reported R+ and 0.11". 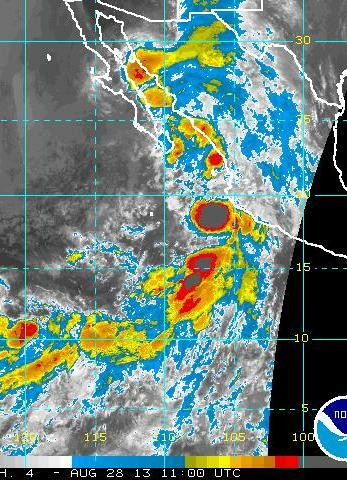 Eastern Pacific IR image at 6 am at bottom shows deep, tropical cloudiness extending into the Southwest. 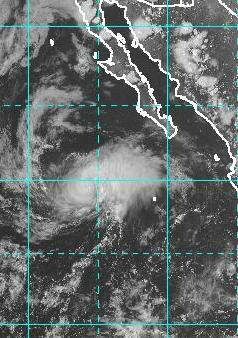 The tiny TS Juliette is along the west coast of southern Baja. Tropical Storm Juliette develop quickly this early afternoon south of Baja. The first NHC forecast for Juliette is shown above, indicating a short life, as it moves quickly northwestward along the west coast of southern Baja. First, it was very suppressed over southeast Arizona yesterday, as shown by the plot of CG lightning strikes detected during the 24-hours ending at 5 am MST this morning. 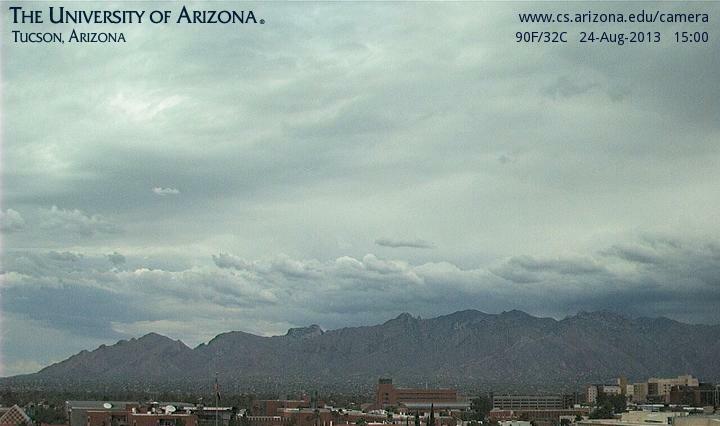 Storms were active in the more moist air over central Pima and parts of Maricopa and Pinal Counties. 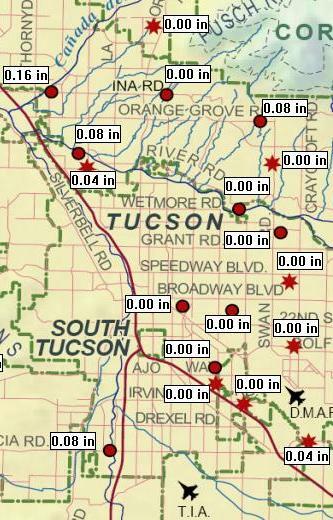 Two ALERT sites show 0.04" this morning, otherwise there was no rainfall measured in the network. The eastern Pacific is very active right now with numerous areas of deep convection still active at 5 am MST - IR image above. An MCS has moved over the northern GoC, which will help push low-level moisture northward across the border. Note also the extremely cold cloud tops with the MCS off of Cabo Corrientes. Closer to us, the inverted trough that was moving across Mexico and Texas yesterday has split apart with one piece drifting northward over western Kansas, while the main portion of the IT is moving fairly rapidly across northern Mexico, extending into southern New Mexico and southeastern Arizona. A very large cloud mass is associated with this part of the IT - see visible image below from 7:15 am MST. Performance of the WRF model at Atmo has been somewhat erratic the last few days. Both versions of the early run of the model forecast some storms over eastern Pima County, however both forecast strong to severe storms and heavy rains to occur to our west and southwest again today. Shown below is forecast rainfall through midnight tonight from the early WRF-GFS - some forecast amounts exceed three inches. This is out where the models bring in the strongest influx of GoC low-level air. The NAM version of the forecast is drier, but with the max in the same general area and with little rain at all over eastern Pima County. Both models forecast fairly strong easterly low-level winds, which is not good, but they also forecast considerable sunshine during much of the afternoon (although the GFS version spreads a large anvil cloud and low-level outflow over Tucson from the southwest by 4 pm MST) with high temperatures reaching around 100 F. Precipitable water continues to increase during the forecasts. The forecast 6 pm MST soundings for Tucson, in both versions, would appear to be favorable for stronger, more organized thunderstorms than the models forecast locally. So, another day with many "ifs, ands, and buts." Yesterday was much more active in eastern Pima County than any of the model forecasts I looked at indicated. This was very similar to the 22nd of August when models forecast CAPE holding over eastern Pima County but did not forecast much in the way of storms. Here at house there was a storm around 4:30 pm MST that produced strong outflows but only a trace of rain. Then, just at dark a cluster of storms moved from the Rincons across parts of town. Those storms produced a lot thunder and a brief moderate shower that left behind 0.03" of rain here. Lightning plot above shows CGs for 24-hours ending at 6 am this morning. Across the ALERT network during past 24-hours 47 sites had rainfall (a bit over 50% coverage). Amounts were again generally light with 12 sites having 1/4" or more and only 3 sites with 1/2" or more. Models continue with dry forecasts today and precipitable water is down to around an inch, give or take a bit, across southern Arizona, except for the southwest corner where values were holding around 2 inches this morning. However, as per last week, both versions of the early WRF run at Atmo forecast reduce, but continued, CAPE late in the afternoon and evening but only indicate a couple of isolated, evening showers over the mountains. At 500 mb a huge anticyclone covers the U.S. and Mexico - above 12 UTC analysis from NCAR RAL. There is an inverted trough across central Mexico that extends into north-central Texas. This feature will move into the Southwest during the next two days and bring increased storm activity tomorrow and Thursday. The early WRF-GFS forecasts PW to increase dramatically over southern Arizona during Wednesday night. The forecast of PW valid at 6 am MST Thursday morning (the 29th) below shows vales back up in the 50-60 mm range from Tucson westward. 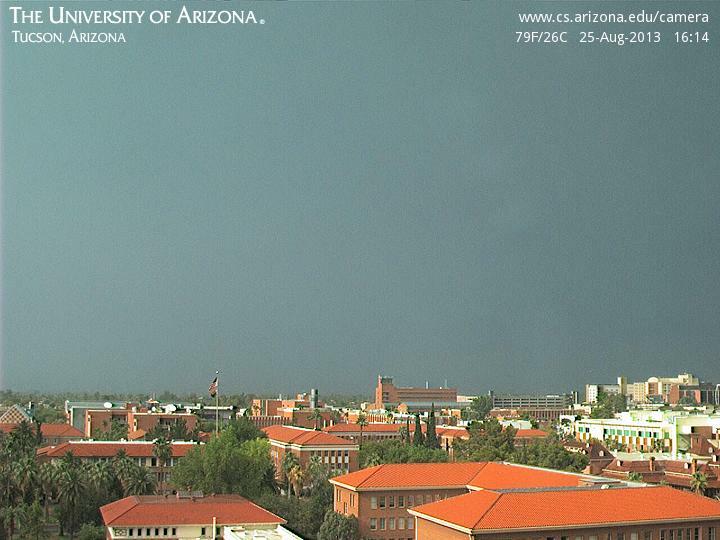 Heavy storm just north of house at 4:54 pm MST, moving west along flanks of Catalina Mountains. 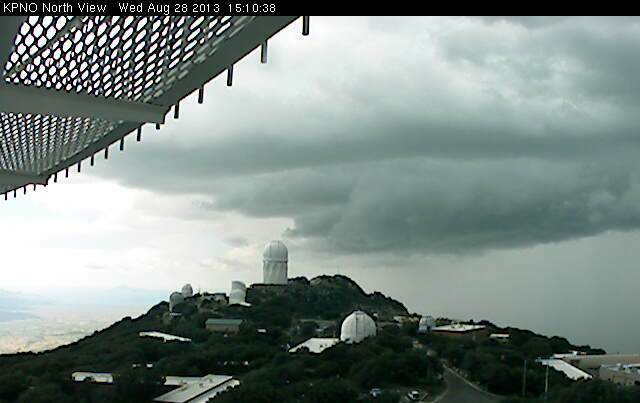 This storm developed on flanks of Rincons and then jumped over to the south side of Catalinas. Thunder and spits here. Radar below is nearly at the same time and shows the cell above east of an arc of stronger storms out west of Sells. The storm of interest moved into the anvil from the storms to west and immediately dissipated. There were some pretty impressive rainfall totals in San Diego county yesterday. 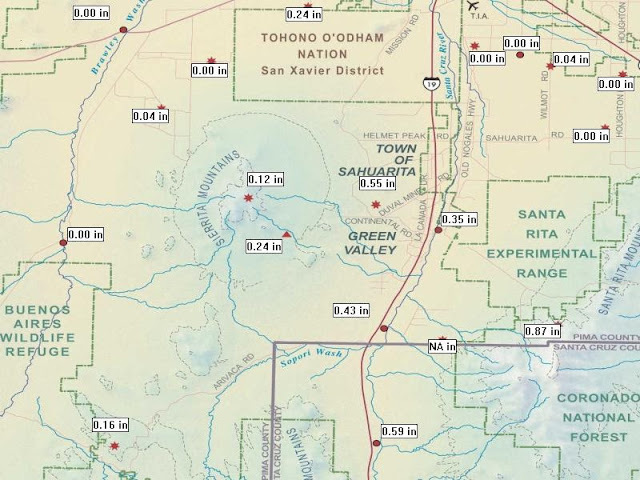 Several desert and mountain sites recorded more than 3", and the Pine Hills RAWS station, near the mountain town of Julian, had 4.42" on Sunday. That was enough to cause widespread flash flooding in the desert washes. At my house--despite making into a flash flood warning box last evening--only got a few drops. We're getting a few more this morning. PW values remain very high, and if we could get any heating we could get some very good storms today, too, but the widespread cloudiness might keep amounts light. Looks like a good week over here anyway. Several strong thunderstorms let loose on southern Nevada and California today. Attached is an image from the Clark County (NV) Regional Flood Control District web site showing the NEXRAD QPE (maximum > 8") for the6-h period ending just after 6 PM LT. One station north of the maximum reports 4.06" of rain. Mean annual rainfall at KLAS is about 4.5". If I am reading the tables on the Clark County RFCD web site correctly, a three inch storm has a recurrence interval of about 100 years in this area (presumably that is at any given location). 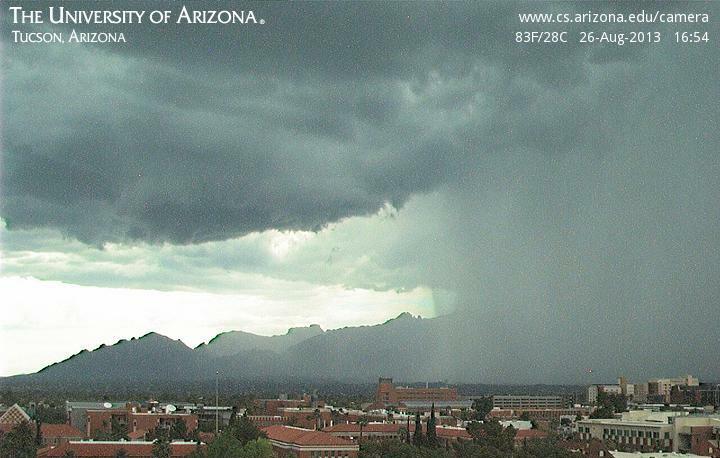 Showers across eastern Pima County yesterday afternoon produced interesting vistas. 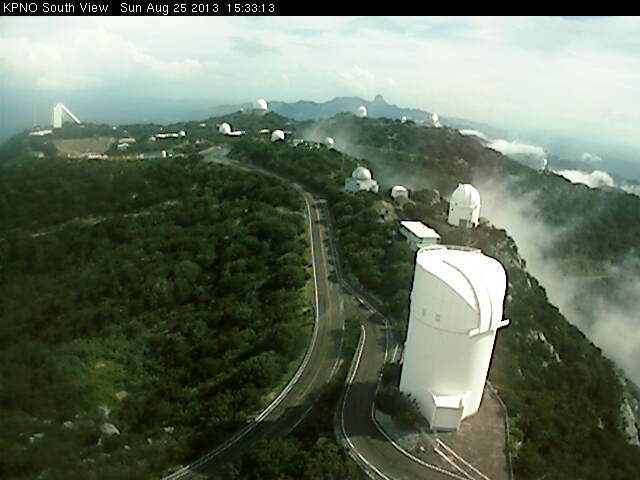 Above image looking south from Kitt Peak, about 3:30 pm MST, shows low clouds clinging to the mountain slopes. View north from campus below, a bit after 4 pm, shows the mountains totally obscured, with sunshine illuminating the campus. Campus had a golden hue as the students prepared for the first day of classes today. 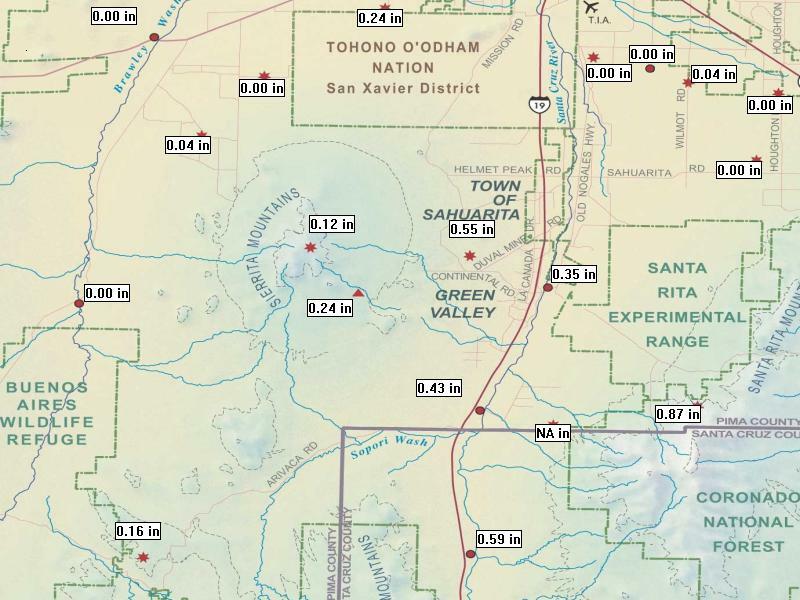 Rainfall for past 24-hours shown above for the Catalinas sector of the ALERT network. Generally heaviest storms affected mostly the mountains and slopes, and weakened rapidly as they moved to lower elevations. We had thunder and light showers here before 4 pm that produced 0.05" and then showers during the night produced another 0.05". Across the network 87% of the stations reported rainfall, with 20 sites having more than 1/4" and only 5 sites having more than 1/2". Lightning CGs across southeastern Arizona are shown below for period ending at 5 am this morning (Monday 26 August). 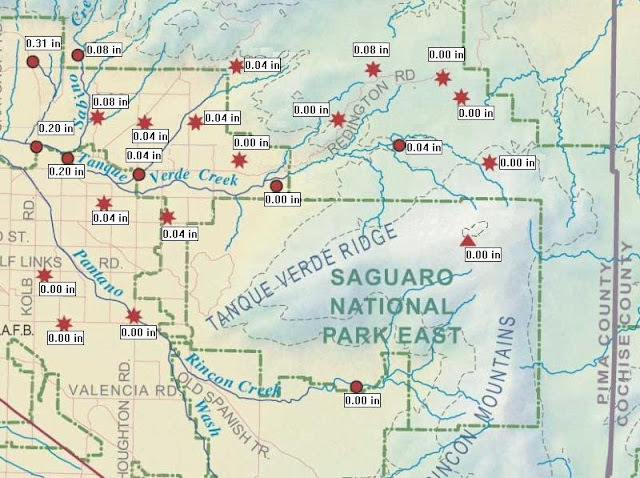 The impacts of the Ivo moisture surge were most pronounced out west in the lower Colorado River Basin and the southern California mountains and Mojave Desert. 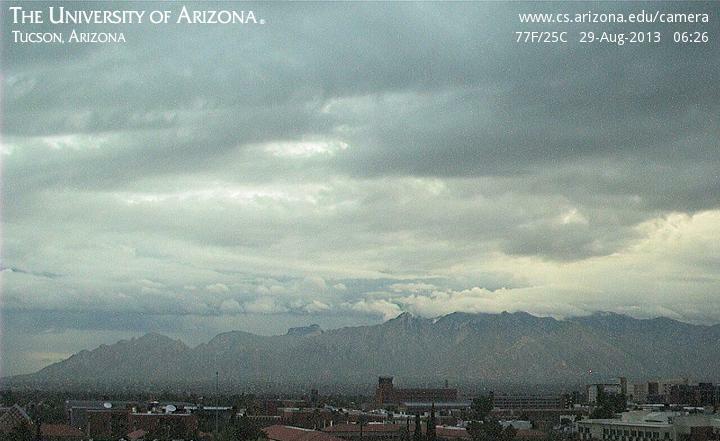 This morning it remains very moist across southern Arizona. the morning Tucson sounding, above, is the most unstable of the past several days, although there is a cool, stable layer at the surface. The models forecast a push of drier air, on easterly low-level winds from New Mexico, this afternoon and evening. The early WRF-GFS forecasts activity to be west of here today, while the NAM version forecasts a line of storms to move across eastern Pima County ahead of the dry air intrusion. I would lean toward the NAM version, but also will check the new morning forecast runs. Storms should develop over the mountains, but may again have trouble moving to lower elevations. There has been sunshine for a couple of hours over southeast Arizona. Temperatures have gotten into the low 90s and thunderstorms are developing. Tucson radar above from 1:27 pm and 12z WRF-GFS forecast of radar valid 2 pm is shown below. Bottom is WRF-GFS forecast TUS sounding valid at 2 pm. Looks like the 12z WRF-GFS run at Atmo is working out pretty well and that there will be thunderstorms across eastern Pima County this afternoon. Tucson's morning sounding (above) is quite wet today (Sunday August 25th) and has considerable CAPE - if a significant boundary layer can develop. However, the visible satellite image below from 6:45 am MST shows that the cloud shield associated with Ivo (now a weakening depression) is very widespread and apparently quite thick. Thus, heating may be limited again today. The upslope flow over the mountains may be enough for high elevation storms to develop today - but will they be able to come off the mountains? Another tough forecast. The early run of the Atmo WRF-GFS forecasts considerable thunderstorm activity this afternoon and tonight across eastern Pima County - which would be considerably different than yesterday. The WRF-NAM also forecasts storms over eastern Pima County, but not to the extent of the GFS version. The models, however, are forecasting considerable sunshine (above is GFS solar irradiance watts/m**2 valid at noon). The sunshine heats things up into the middle 90s by 2 pm MST this afternoon (below again from GFS version). Yesterday's high at the airport struggled to reach 92 F. With today's high forecast for the airport to reach only 89 F, much of what happens today will depend up the local heating. Heavy cloud cover prevailed in the Tucson area yesterday afternoon, keeping temperatures down and thunderstorm activity very damped - above shows Catalinas at 3 pm MST on Saturday August 24th. Plot of CGs for 24-hours ending 4 am this morning shows little activity over much of southeast Arizona. Strongest thunderstorms covered western Pima County and the Colorado River Basin. Storms over the coastal ranges and Mojave of southern California were very impressive on radar yesterday afternoon. Rainfall was limited for the metro area, especially at low elevations, through 5 am this morning. Across the ALERT network 39 sites had rainfall (42% and down some from yesterday morning's observations). Amounts were mostly light, with only 10 sites measuring a 1/4" or more. 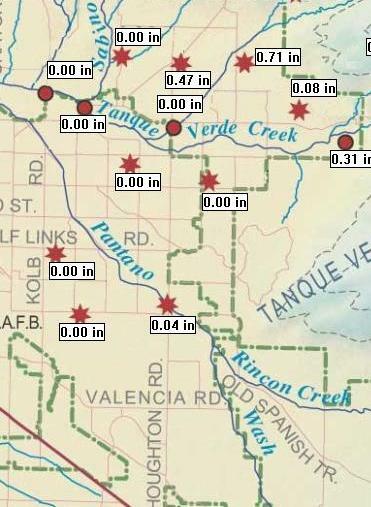 Florida Canyon, in the Santa Ritas, had the most rainfall in the network with 0.87". Sprinkles here at house during the night left us with another Trace day. The three ALERT panels shown here cover the entire metro area and the southern part of the network. More active day than anticipated yesterday for local area, especially higher elevations from north-east-south. There were 53 ALERT stations with rainfall during past 24-hours (58% areal coverage) - 12 sites had 1/2" or more and 4 sites had over 1". Greatest amount was near Arivaca in the far southwest corner of the network. 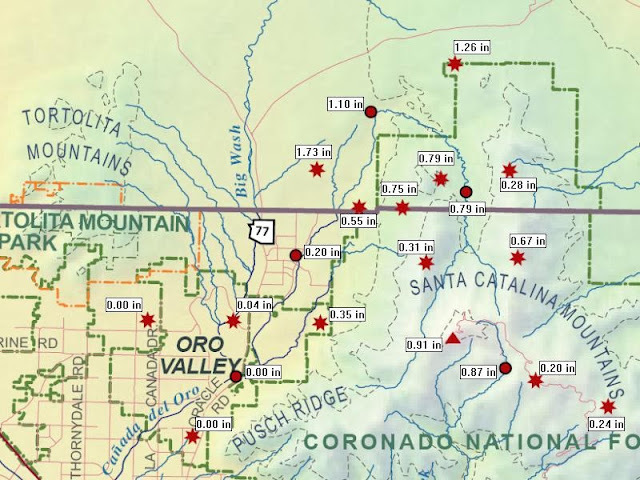 Plot above shows the Catalina Mountains sector of the network, with high amounts extending from near the crest northward into Pinal County. Here at the house we had a very brief shower around 5 pm that produced 0.04" of rain - I didn't hear thunder, but there was lightning to the north and also to the west. Brisk easterly winds at sunrise - Mike Leuthold mentioned these yesterday, since they add an additional complication to the mix of weather ingredients this weekend. 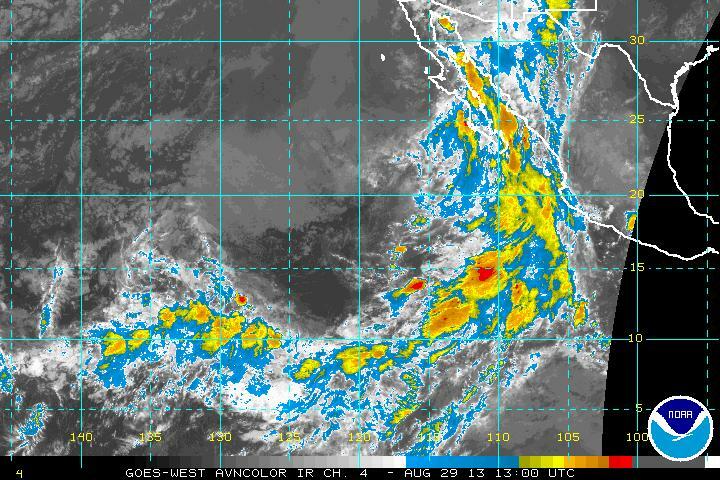 The 6 am MST IR image below shows the cloud masses associated with TS Ivo - the Ivo circulation is large and La Paz, Mexico, at the south end of GoC, has south-southeasterly winds of 20 kt and greater from surface to above 300 mb. Precipitable water down there is nearly 60 mm. Note also that there was a morning MCS centered southeast of Douglas, Arizona. Outflows from this have keep low-levels cool and moist locally and helped to enhance the east winds. The early WRF forecasts (both variants) went seriously awry early in the forecast cycle. Both the GFS and NAM versions forecast a pre-sunrise MCS centered over eastern Pima County. So, I have not looked at the runs in detail. The range of possible outcomes for the weekend continues to be substantial in the models. The above graphic shows total rainfall predicted for the 48-hours ending at 12 UTC Monday by this morning's NAM forecast, while the graphic below shows total rain ending ending at same time from the midnight GFS forecast. The NAM now forecasts heavy rain areas across most of Arizona, while the GFS continues to keep heaviest activity along the Colorado River Basin. I noted that the most unstable sounding this morning was that taken at Las Vegas, Nevada. Drying From East This Afternoon?